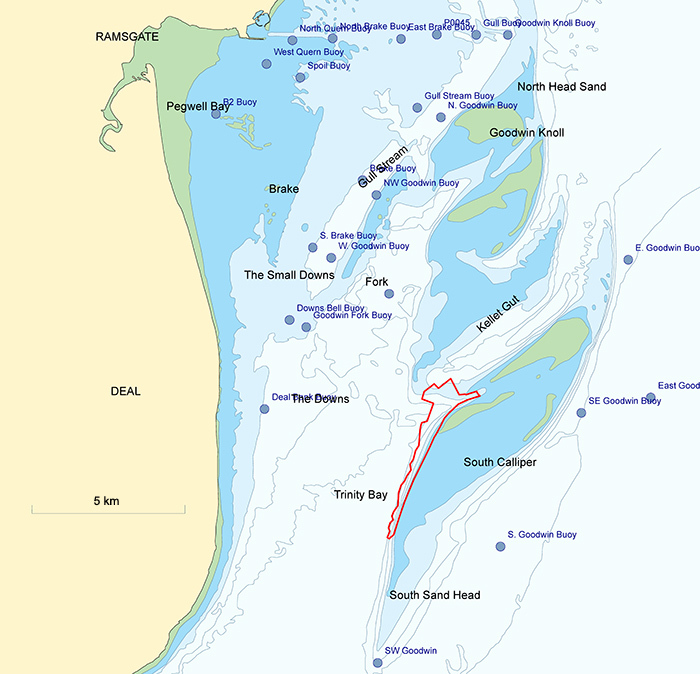 Dover Harbour Board (DHB) is proposing to dredge over 2 million cubic metres or 3 million tonnes of sand and gravel from the historically-important South Goodwin Sands for their Dover Western Docks Revival development. It has been estimated that over 2000 ships have been wrecked here but only a few have ever been found. The Goodwins are also the last resting place of many airmen who were shot down during World War II and one of thoise has now been found. A geophysical survey was carried out on the site to detect any archaeological remains on or buried in the seabed. 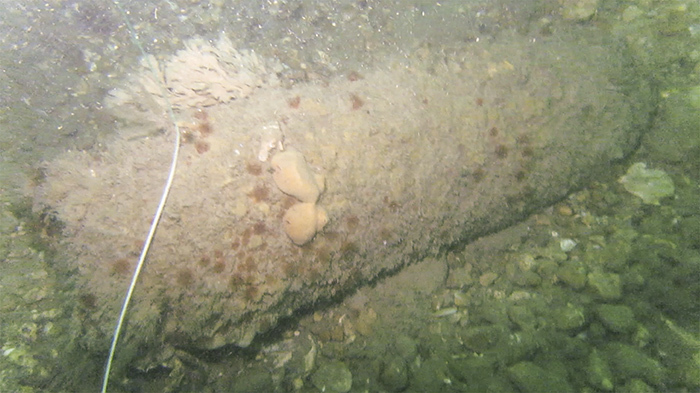 The geophysical survey was analysed and hundreds of targets or objects were detected, some on the seabed that were detected by sonar, some buried and others that were only detectable by their magnetic signature. One of the targets that was identified was number 7212 which was detected using sonar and the magnetometer. This target covered an area 80m x 33m and was described as 'a seafloor disturbance'. This was something that had not been detected before, yet it was not investigated as part of the archaeological investigation as none of the targets found during the survey are required to be identified and recorded. The aircraft was identified only because a local diver visied the location and then made a video of what he found. 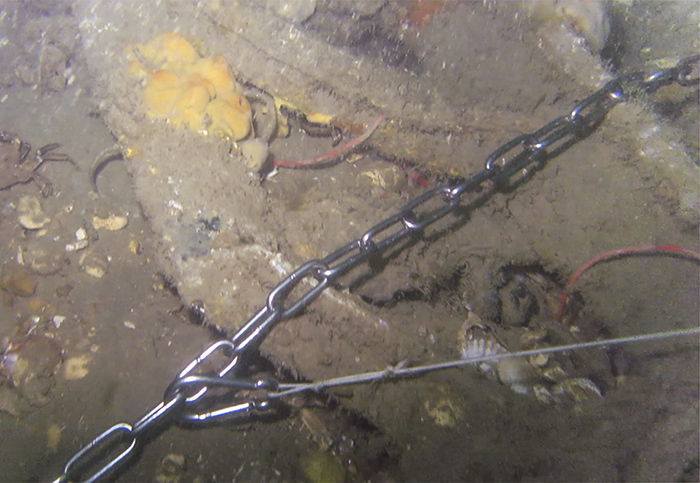 There are significant aircraft remains on the seabed. 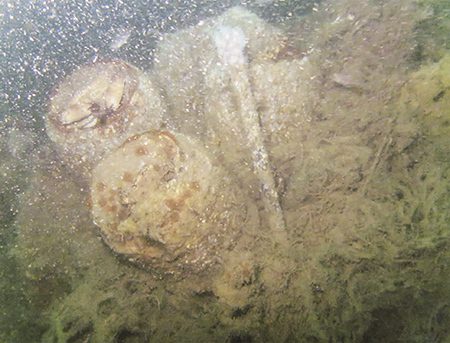 Two radial aircraft engines with propellers lie partly buried in the seabed suggesting that more aircraft remains could be found buried just beneath the seabed. The engines have fishing net wrapped around them; trawlers regularly visit this area and at some time in the past at least one trawl net has hit this aircraft and become snagged around the stronger parts like the engines. It is also very likely that lighter, weaker parts of the fuselage will have been scattered across the seabed by trawlers. 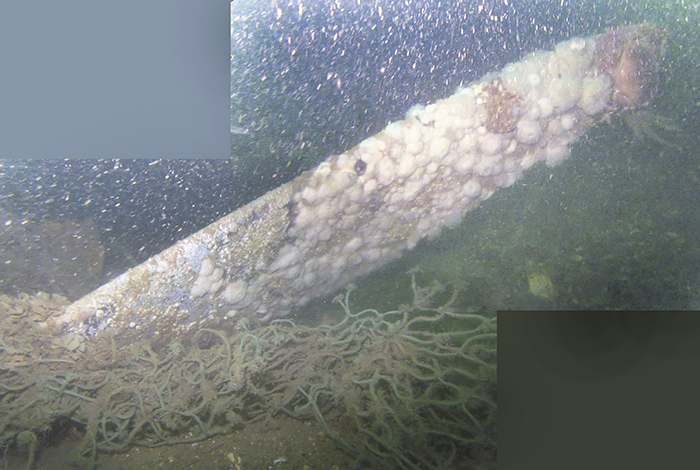 Broken remains of fuselage lie on and partly buried in the gravel seabed and are scattered over a wide area at least 80m long and 33m wide. A number of intact bombs have also been seen which we can only assume are still live and potentially explosive. No human remains have been found so far on this site but as some of the aircraft may be buried in the seabed it is possible that remains of the crew may still be found. To the north of the aircraft approximately 170m away lies another radial aircraft engine, target number 7208 on the geophysical survey. Yet another radial engine lies approximately 1900m south of the aircraft and was given target number 7291. Both of these engines were identified by local divers rather than being investigated as part of the pre-dredging permission process. 7208 was identified as 'a dark reflector', an irregular object with corresponding sonar shadow and some bright shadow and a slight mound on the multibeam sonar. Even tough this was an aircraft engine like the others this target was not detected using the magnetometer. This is one of eight similar targets in the area that should be investigated. 7291 was identified as 'debris', a small object with long angular bright shadow but it was detected by the magnetometer but only on one runline showing that engines are hard to detect this way. This target is one of seventeen in the area that should be investigated by divers. We do not yet know the nationality, age or type of this crashed aircraft. Finding one aircraft with two engines suggests that the wreck of aircraft 7212 is the remains of a twin engined bomber lost in WWII, most likely to be German but could be some other nationality. However the other two engines could be from the same aircraft, with one dragged some 170m north and one 1900m to the south by trawlers who operate in that area. Alternatively more than one aircraft may have been located, so further on-site investigation is required. Divers now need to visit the aircraft and engines, carefully record each engine type and the aircraft remains to help work out which type of aircraft have been found, and possibly to identify the actual aircraft that were lost. How these remains of an aircraft from World War II were found and identified highlights significant problems in the pre-dredging permissions process. The aircraft was not identified as part of the pre-dredging investigation as there was no requirement to dive and investigate any of the 315 sites of potential archaeological interest within the exploration area. The aircraft was detected during the geophysical survey but it was not identified as an aircraft. The geophysical survey was undertaken by a suitably qualified and experienced commercial survey contractor and produced high quality results. The results were analysed by a suitably qualified and experienced commercial archaeological contractor who processed the information correctly. But despite this being a large target with a magnetic signature that indicated the presence of iron or steel, the target was given the category A2, which meant 'Uncertain origin of possible archaeological interest', rather than A1 meaning 'Anthropogenic origin [man-made] of archaeological interest'. The note describing the target said 'this feature could be exposed geology outcropping on the seabed' (WA 2017a), even though the target clearly contained iron or steel. Even with good survey data processed by experienced analysts the aircraft wreck and the two engines was not identified. This demonstrates that aircraft remains cannot be reliably identified prior to any seabed development using the currently approved process. 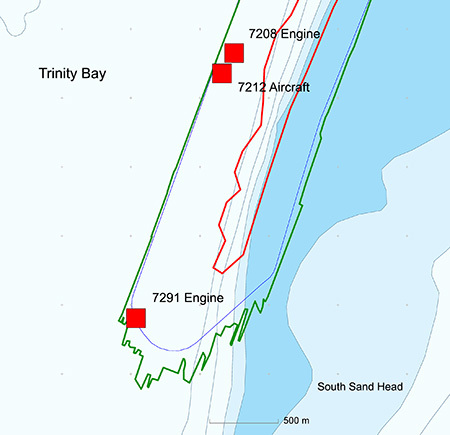 Particular problems are faced in relation to locating and identifying aircraft in advance of and during dredging operations. And yet this aircraft was still misidentified showing that the methods have not improved. Diver investigation of the targets is still the best method for identification but was not made a requirement for the Goodwins pre-dredging survey. Please note that all military aircraft in UK waters are automatically given protection under the Protection of Military Remains Act 1986. The Act makes it an offence to interfere with a site, to disturb the site or to remove anything from the site. Divers may visit the site but the rule is look, don't touch.